Thursday, July 21st at 9:45 A.M. Please join the Friends of the National World War II Memorial for a very special panel discussion with several WWII veterans and members of the “Greatest Generation,” including Colonel Charles E. McGee, one of the famed Tuskegee Airmen and a career officer in the United States Air Force for 30 years. Colonel McGee holds a U.S. Air Force record of 409 fighter combat missions flown in World War II, Korea, and Vietnam. This event is open to the public, but seating is limited. The WWII Veterans Discussion Panel is part of the Friends of the National World War II Memorial’s first ever Teachers Conference being held at the Women in Military Service to America from July 20-22, from 8 a.m. – 4:30 p.m. each day. The conference is part of Friends’ continuing efforts to honor and preserve the national memory of World War II. See below for more information about the conference! Jack C. Taylor / Enterprise Rent-A-Car WWII Memorial Education Endowment. Teachers from the DC/MD/VA area have been invited to attend the conference. This year, we are also opening up the conference to National Park Service (NPS) Volunteers, as well as NPS Rangers and Washington, DC tour guides. Next month’s conference will feature six presentations by WWII veterans, educators, and other experts in the area of WWII history, three tours of sites of WWII significance, and a remembrance ceremony at the WWII Memorial. Please note: There is no cost to participate in the conference. Participants will have access to free parking daily at Arlington National Cemetery. Breakfast and lunch will be provided each day. Transportation between WIMSA and tour sites will be provided by Friends. If you are interested in taking part in this three-day conference, please complete the application found here. Please return the form by June 30th to acoughlin@wwiimemorialfriends.org or fax to 202.675.2018. 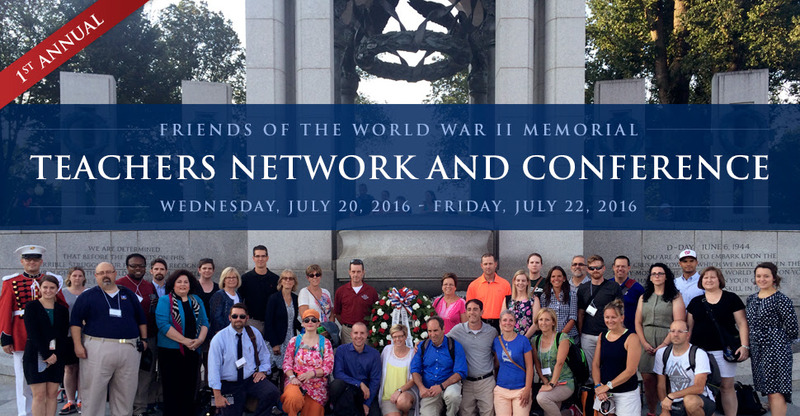 I hope you will consider joining Friends as we expand our efforts to honor and preserve the national memory of WWII.